Caudata, or Urodela, are the Tailed Amphibians known as Newts and Salamanders in English, Molche und Salamander auf Deutsch, les Tritons et les Salamandres en Français, los Salamandras en Español and Хвостатые земноводные по-русски (Russian). Our mission has always been to facilitate the sharing of accurate science-based information about newts and salamanders, with an emphasis on their maintenance in captivity. The Discussion Forum is frequented by hundreds of people every day. We have members from all over the world. Some are scientists, some are zookeepers, but most are hobbyists with a friendly enthusiasm for these fascinating creatures. Our forum is the backbone of the Caudata.org community. And while we do place an emphasis on the maintenance of amphibians in captivity, we also support field work, conservation and scientific research. 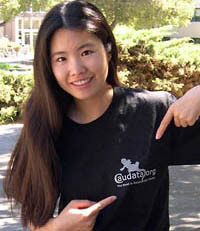 The 2010 Caudata.org Research Grant (in conjunction with Amphibian Ark) is being awarded to Elizabeth K. Timpe of the University of Connecticut, USA, for her project on Eurycea aquatica titled "Uncovering Genetic Diversity of a Salamander Species Restricted to a Critically Threatened Habitat". Our 2009 Caudata.org Research Grant (in conjunction with Amphibian Ark) was awarded to the Chaves Portilla research group at Fundación Ecodiversidad Colombia for their project on the conservation status of the Pandi Mushroom-Tongue Salamander, Bolitoglossa pandi. Caudata.org Magazine is the only English language publication devoted solely to newts and salamanders. Caudata Culture is the world's premier salamander and newt care and information resource, and arguably better than any book. There's a good reason that Axolotl.org comes up first on any google or yahoo search for "axolotls": it's the definitive text on the famous Mexican salamander in captivity. You'll find many web sites at Caudata.org. And while you're looking around, why not get a shirt like Pin-pin's in the photo? Do you have an axolotl? Due to popular demand we now have a chat facility again. It's available towards the bottom of the forum index page. I created Caudata.org in 2001 as a community for people to exchange information, ideas and captive bred newts and salamanders. For over 10 years the site was funded by the donations of its members – thank you! Saw this on usark website, does this mean the ban is over.